The UC San Diego men’s tennis team faced off against Concordia Irvine University in a match at the Northview Tennis Courts in La Jolla, California. The Tritons took four singles games and two doubles games to secure the 6–3 victory over the Eagles and improve to 9–5 overall. The day started with the doubles matches: sophomore tandem Marc Isaia and Sreeganesh Manoharan at the No.1 spot, seniors Eric Tseng and Justin Zhang at the No. 2 spot, and freshman Eskil Jarlskog and junior Richard Han coming in at the No. 3. Isaia and Manoharan quickly dispatched their opponents, freshman Florian Mayer and junior Daniel Reddman, 8–1. The No. 2 doubles game was much closer — Tseng and Zhang dropped five games to the duo of freshman Thomas Kyle and senior Man Ho Ko to grab an 8–5 set win. Jarlskog and Han fell short, losing 8–5 to the Eagles’ No. 3 team, consisting of juniors Nikita Katsnelson and Shimon Murakami. UCSD took the No. 1–4 victories on the singles side. No. 1 Tseng defeated Mayer in two hard-fought sets, 7–5, 6–4. At No. 2, Zhang trumped Eagles graduate student Joseph Bray (6–1, 5–7, 6–2). The No. 3 singles, Isaia, earned a win in three sets, topping Katnelson 3–6, 6–2, 6–4. Jarlskog handed Reddman a loss at the No. 4; he dropped the first set 3–6, won a tiebreaker by 5 points in the second set (7–6), and bageled Reddman in the final set (6–0). 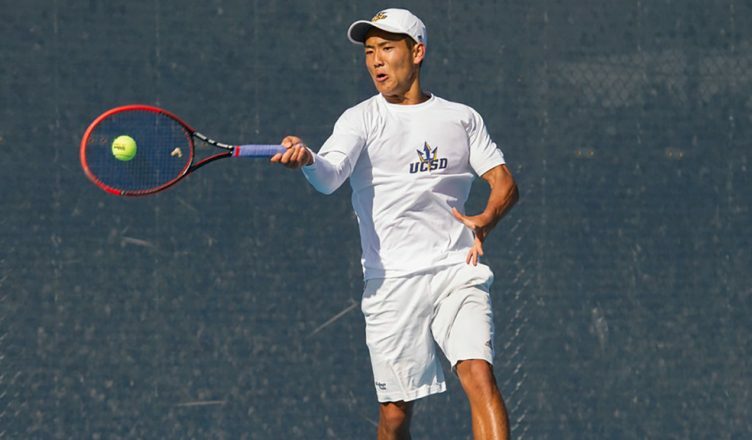 UCSD’s Han was unable to defeat Kyle, who handed the Tritons a 6-2, 4–6, 6–2 defeat at the No. 5 singles spot. Ko gave the Tritons their second singles loss at the No. 6, easily winning against UCSD sophomore Marius Ruh and handing the Triton a bagel (6–1, 4–6, 6–0). UCSD looks to face off against Point Loma Nazarene University on Tuesday, April 10. The match is set to begin at 3 p.m.